I have probably 9 or so original C828 Panasonic transistors...might have to build one of these one day. I found the transistors in some old photography analyzer equipment from decades ago... haven't found a permanent use for them, as they don't sound too great in most applications. I just grabbed some on ebay, probably fake but for $2 who cares? Going to breadboard this with 5088's tonight. Vol 1 to ground, not 3 of course I'm thinking. Interested to hear this one. I think i might build just the fuzz. How would i go about increasing the output volume to get closer to unity gain? Any plans to do the 8TR version? I imagine it's just a Super Fuzz with the wah circuit above, can you confirm and save us the time? I was borrowing one for a while and really liked how you could use the wah to notch the fuzz tones on the normally-boring thin tone setting. Rad!! Next people will want you to take on the Shin Ei Wah-Hurricane-Siren-Surf, that one's a beast!! Nice one Zach. 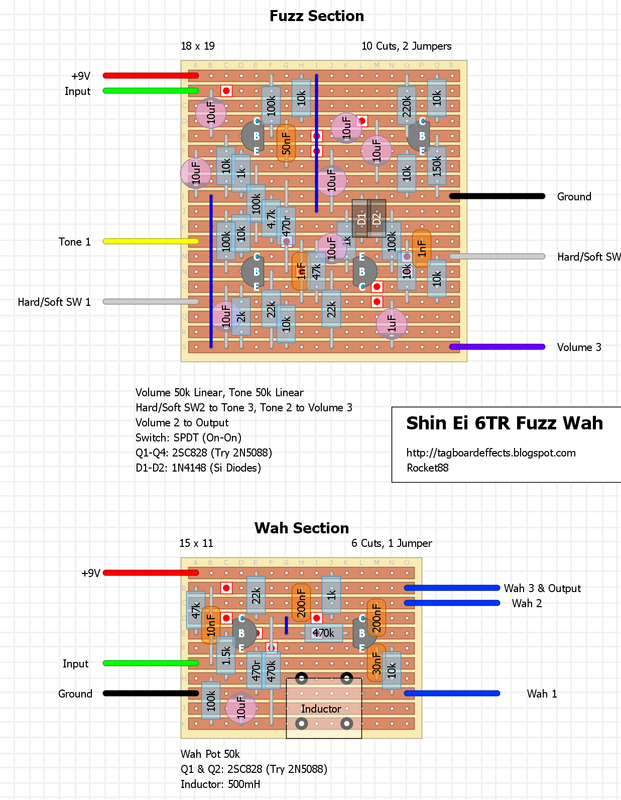 This is like the one Superfuzz variant that I haven't tried, in other words, it's a must build! Damn straight. From the clips it's gnarly and I may just build the fuzz as a stand alone too. It's an oddball variant, and I found 2 more the 10TR, but can't find any real info on it and looks completely different. Personally, and I've said this in I think all the wah builds, but look on eBay for the tonetank by joe gagan. He makes them all, can customize the inductance if need be, amazing quality, will help you out if you have questions, and they're the best sounding inductor in my opinion. Not to mention they're not really expensive. I have the link posted in the other wah threads, and can't post it now cause I'm mobile. I'm pretty new when it comes to inductors.. but is this one used in this build a certain type like a dual inductor? As it has 4 pins? Would a 2 pin one work fine? As these are easier to find for cheap. A little confused. Also does the value of the inductor affect the tone or the circuit drastically at all? Only 2 pins are used. I just forgot to remove the other 2 from some of the layouts. Some inductors come with 4, as the 2 pins are just repeated. And the inductor value has a huge affect on the tone. Wow! Thanks for posting this! I used to have this exact model. (the Kent Fuzz-Wah) Sold mine to John Otway back in '79. (along with a Monacor Fuzzder! What was I thinking?) Definitely going to give the fuzz section a go.